What a year! The Fox Valley MABL, located throughout Northern Illinois and Southern Wisconsin, remained super competitive as well as great group of teams which feature stellar ballplayers. There were lots of close games coming down to the wire, which always makes it fun. The McHenry Rough Riders were seeking a revenge year after falling short to the Round Lake Pirates in 2017’s World Series. After having a bad taste, the Rough Riders came out strong with a nine game winning streak although every game was a hard fought battle. We finishing the year with a 15-3 record as the #1 seed heading into the playoffs. Great pitching and defense was our story. Every player played an intricate role by putting winning first and playing small ball to find a way to win. Every team gave us a run including the Spring Grove Orioles, Northern Illinois Coyotes, Johnsburg Tigers, Kenosha Javelins, Kenosha Chiefs and last but not least the Round Lake Pirates, who are the 2017 defending champions. 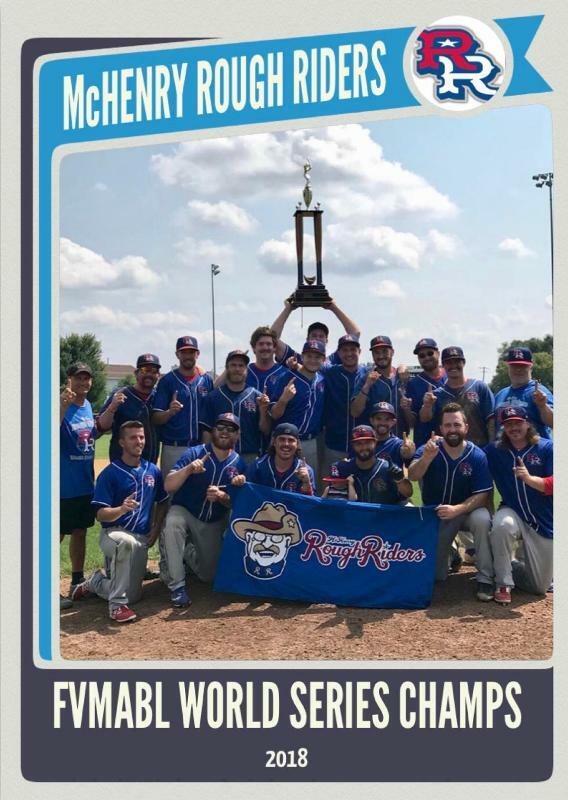 The World Series between the McHenry Rough Riders and the Round Lake Pirates featured a couple of one run games and some extra innings, really showcasing good defense and timely hitting. When the final out was made the McHenry Rough Riders were crowned CHAMPS! Every team in our league has great guys and good sportsmanship, especially the Round Lake Pirates. Afterwards both teams went to the local tavern sending pitchers of beer to one another saying they can’t wait to faceoff next year in the World Series. On behalf of the McHenry Rough Riders and the Fox Valley MABL ‘thank you’ for making it possible for us guys to play the game we all love!